(thankful) that it was a mouth organ I found in the boxes yesterday and nothing louder like a drum or a trumpet. The main benefit is being woken up at 6.30am this morning by H who was playing us a soothing tune. It made her feel tired too so she got into bed with us and napped for a bit longer. (wishing) the weekend was longer. Already it’s over and I feel like I’ve barely rested before I’m back into another five days at work. (glad) we’ve had a lazy weekend. We always seem to be busy so to stop and do nothing was nice. 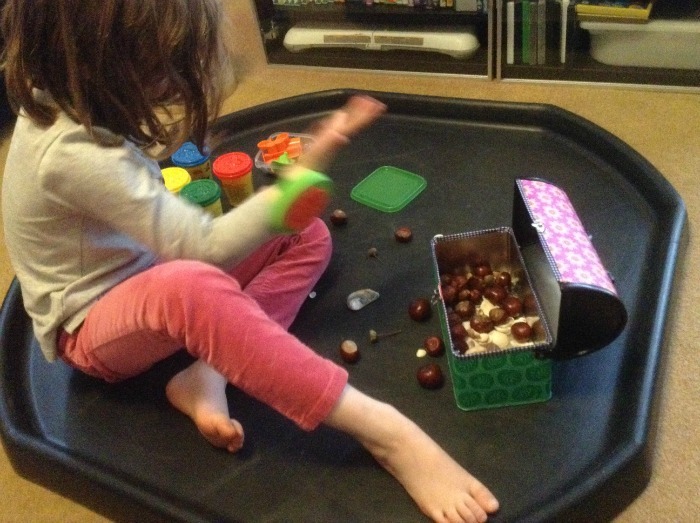 We cleaned the Tuff Spot and brought it inside for some contained messy play for H. I covered my old Emily Strange tin with Tiger Stores drawer liner so it’s now H’s treasure chest, and filled it full of stones, pebbles and conkers that she’s picked up of late. Then we got the 101 Cookie Cutters out and made shapes. I found some old PlayDoh and we had a good play sticking the shells into that and making ‘cakes’ for daddy. (accomplished) clearing out old things which I should have done years ago. Although Shaun mentioned there are more boxes under the stairs which I’ve insisted we check tonight. This may be a foolish thing to do. (sad) anniversaries. Yesterday I found my old Wedding album and today I’ve had two ‘Happy Anniversary’ comments when it was back in June and it’s a sadder anniversary today. Not their fault, not anyone’s fault. H asked “do you miss him a lot?” (my dad) and I confirmed that yes, I do. A lot. (scared) potential exam to be re-taken again. I found my old exam results in the big clear out and saw how many times I’d retaken those. Exams and me do not mix at all. 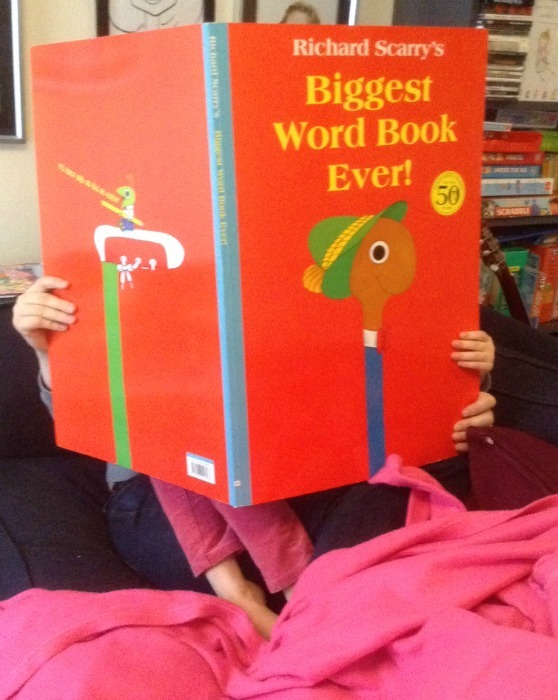 (proud) H’s reading is really coming on. When I insist she sits with me she gets cross, and when she sits and does it on her own she gets it first time. Her confidence is improving and I hope it’s reflected at school and that she isn’t too shy. She isn’t the most confident of children and a knockback really pushes her back. I think she’s okay though. She’s also started spelling some words, working them out and writing them down which is a new progression – before now she’d just put random letters together and ask me what they said (usually ‘jsdweaxxeekkw’) Now she’s telling me the word she wants to spell and is pretty accurate too. I’m not sure I’d be getting her doing that if we were to homeschool (but I haven’t ruled it out still). (scared) we have no batteries in the house that fit the Furbys. There are two of them. It may stay this way a little longer but one day it’ll have to happen. (earworm) H has Shaun’s old 8GB iPod Touch now as he’s moved onto my old one. I wiped it clean, removed the internet and loaded it up with her songs. We’ve had ‘Bing Bang’ from Lazytown approximately twenty times in a row tonight as of course she’s already worked out how to press play again and can read the song title. I need some good earplugs. (amazed) H swam nearly a length of the training pool underwater doing crawl – she’s now officially a better swimmer than me in that respect. She came up once for air standing (she hasn’t mastered swimming and doing that). Her body is in a straight line when she swims, so as far as I’m concerned if she gets the technique right and the breathing comes next that would be amazing. Really proud of her though, we just have to work on deep water. Think I’ll be taking out a gym membership this week (roll on payday on Tuesday). I’m linking to Jax’s linky today. Lovely to have you! I love that Richard Scarry picture. He’s such a fab writer. ahh thank you Jax! I will keep this up too! Oh Richard Scarry is so great isn’t he? He’s perfect for H and where she’s at with learning too which is good! There are so many things I want to comment on in that post, I don’t know where to start. Feels like too long since I’ve seen you, we need to catch up. Love the Tuff Spot picture – must clean ours and get them inside. They have been abandoned since the end of the summer, but the kids have been asking to do some proper messy play so I need to get organised. Ohh I know that feeling well, we had to get ours inside, if only to protect the carpet!! That and I bet it won’t be long before we get some glitter out…! !